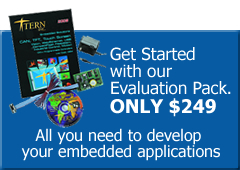 The A-Engine is a C/C++ programmable microprocessor core module (5V only) with a 16-bit 40 MHz CPU. 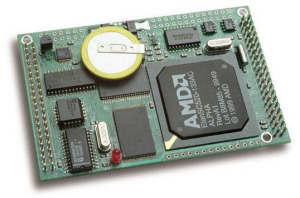 It supports up to 512 KB ROM/Flash, 512 KB battery-backed SRAM, and a 512-byte EEPROM. A real-time clock (RTC72423) provides information on the year, month, date, hour, minute, second, and 1/64 second. Two DMA-driven serial ports support communication up to 115,200 baud. There are three 16-bit programmable timers/counters and a watchdog timer. Two timers can be used to count or time external events up to 10 MHz. They can also be used to generate non-repetitive or variable-duty-cycle waveforms as PWM outputs. The 12-bit ADC has sample-and-hold, a high-impedance reference input, 11 single-ended 0-5V (or 0 to REF) inputs, and a 10 kHz sample rate. Two 12-bit DAC provide 0 V to 4.095 V analog voltage outputs capable of sinking or sourcing 5 mA. The 82C55 PPI can be used to interface to a 20×4 LCD and keypad or other controllers.